Google Analytics Solutions: Welcome to the official Google Analytics Blog! Welcome to the official Google Analytics Blog! and the Google Analytics Help Center. 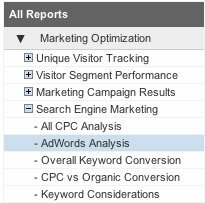 And now for our first product update (which you may have already noticed): there is a new report in Google Analytics called AdWords Analysis. You can see it within your Analytics reports now (located in Marketing Optimization-->Search Engine Marketing). Enjoy, and subscribe to the feed, or visit often to learn about updates like this within hours of their creation. We are pleased to welcome you to the official Google Analytics blog. Now you can stay up to date on the latest info posted by the Google Analytics team. You'll learn about product changes as we make them, whether it's a new feature you’ve asked for, or a fix for something that needed fixing. We’ll let you know when we add new reports (see below) and will ask for your feedback too. And we’ll frequently post tips and best practices, as well as spotlight helpful resources such as Conversion University and the Google Analytics Help Center.